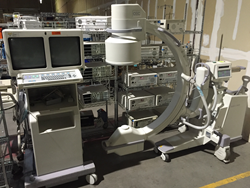 Over 2500 pieces of medical equipment to be auctioned off. Centurion Service Group is very excited to announce the live simulcast auction selling an impressive catalog of used medical equipment. There will be an array of items featuring surgery, endoscopy, anesthesia, obstetrics, physical therapy and central supply equipment. Visit our website to view the highlights here. Based in Chicago, and with locations in Las Vegas and South Florida Centurion Service Group is internationally known as an industry leader specializing in surplus medical equipment auctions. They have rated the largest medical auction house in the world, selling more than 100,000 pieces of medical equipment every year. Erik Tivin, Chairman, and CEO is regarded as one of the most experienced medical equipment auctioneers and appraisers in the surplus medical industry. His entrepreneurial efforts have continued to expand in the last 20 years, and he serves as an executive on the Board of Directors of the Industrial Auctioneers Association. Whether it is your first time bidding at an auction, or are a long-time customer, they offer resources that will assist you in different steps of the auction process. They want their customers to feel well-informed and confident before participating in any of their auctions. To get free tips on becoming an expert buyer click here now! Centurion Service Group will be offering online simulcast bidding only. Registration information and the complete list of medical equipment can be found here.